A slow-growing compact shrub with glossy dark green, heart shaped leaves. 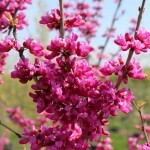 It is covered with bright rosy mauve flowers in the early spring. Tolerates most soils, except poorly drained. It benefits from regular summer moisture and protection from hot and drying winds. It has yellow fall color. 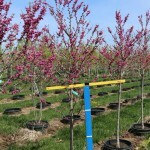 This is a sterile cultivar that was introduced by the U.S. National Arboretum.